In Ongoing Rebuilding Of Ground Zero, A Balance Of Remembrance, Resilience How have developers balanced respect for ground zero's history with taking advantage of some of the most valuable property in the world? Three World Trade Center is under construction near One World Trade Center, which was completed in 2013. 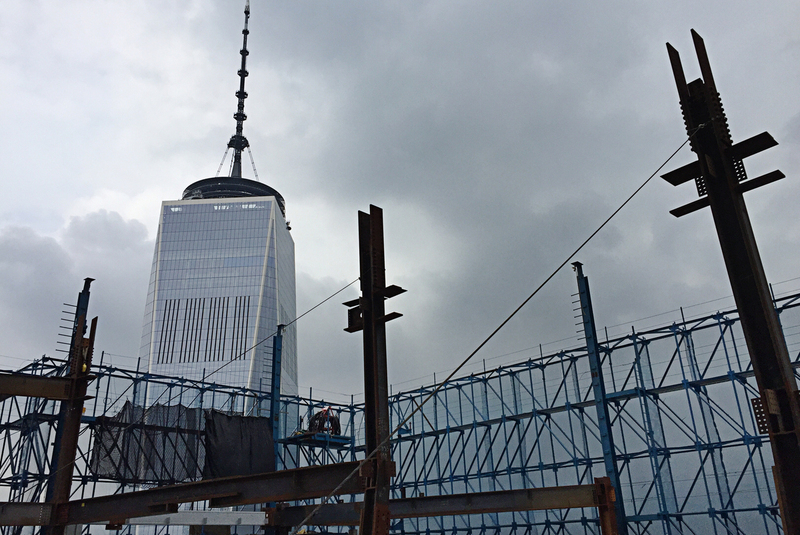 The new building stands 1,079 feet tall, and its topping-out ceremony was held in June. Fifteen years after the Sept. 11 terrorist attacks, the World Trade Center is still one of the world's most scrutinized construction sites. Developers have had to balance honoring the dead while reviving some of the most valuable real estate in the world. The latest addition now open to the public is a $4 billion, marble-floored train station. Every day, thousands stream through the World Trade Center Transportation Hub on their way to their new offices, shopping malls or the National Sept. 11 Memorial Museum. Above them are soaring, white steel arches that have been compared to a rack of whale bones. 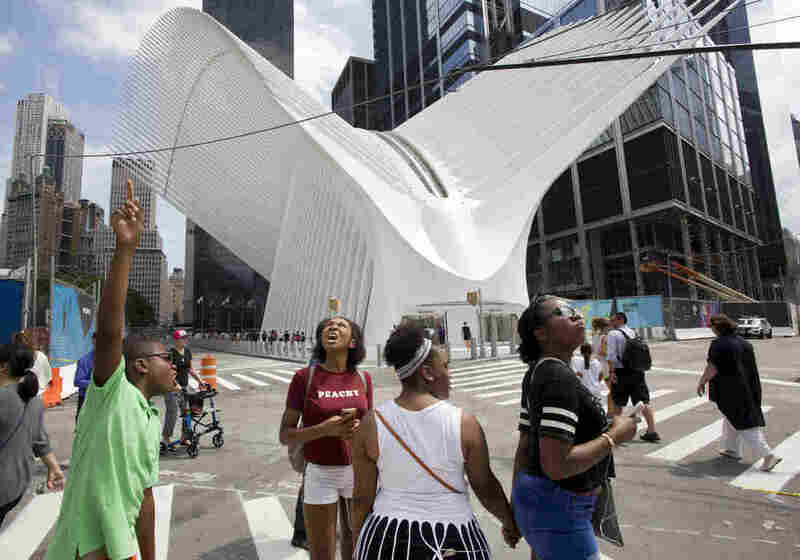 "It actually represents a bird about to take off in flight, and that's kind of the rebirth," says Steven Plate, who oversees construction at the World Trade Center for the site's owners, the Port Authority of New York and New Jersey. That rebirth, he says, includes the transportation hub opening 15 years after the Sept. 11 hijackers turned this entire site into a pit of rubble. Visitors take in the sights outside the World Trade Center Transportation Hub in New York City. "We'll never forget, but we want to show those people who knocked us down that we come back," Plate says. "And we come back better than ever." The people who are part of that comeback crisscross 16 acres of controversy daily. There are the construction workers building the last skyscrapers, which will eventually complete the site after years of delays. There are also the tourists armed with selfie sticks and shopping bags, crowding around the memorial pools where the towers once stood. And then there are the office workers, like Grum Dehenseler, who take smoking breaks under the memorial's oak trees outside One World Trade Center. Dehenseler says that when people find out he works in One World Trade, they usually ask, "Aren't you afraid?" or "Doesn't it freak you out to work there?" "I said, 'No, it doesn't.' This building has been built much better than the ones that were built before," he says. The building's developers did have to slash rents to attract more companies to the new office space. "I didn't mind, but a lot of people did because so many people died on this spot," says Olga Kuznetsova, who works for a Condé Nast magazine that moved in about two years ago. "They were concerned about how to work on top of sort of a cemetery, so to speak." You can see the names of almost 3,000 victims of the Sept. 11 attacks — including those killed in Shanksville, Pa., and at the Pentagon — on the panels around the memorial pools. But it's hard to find many remnants of that day's destruction on the World Trade Center's new plaza. "They're trying to make it like it's a peaceful place, and it's not," says Jim Riches, a retired deputy chief of the New York City Fire Department whose son Jimmy, also a firefighter, was killed on Sept. 11. "It's a place where murder and destruction happened that day, and people in all future generations should see what happened." Seven stories below the plaza, visitors at the National Sept. 11 Memorial Museum can see a crushed fire engine and a memorial wall behind which the unidentified remains of Sept. 11 victims are stored. 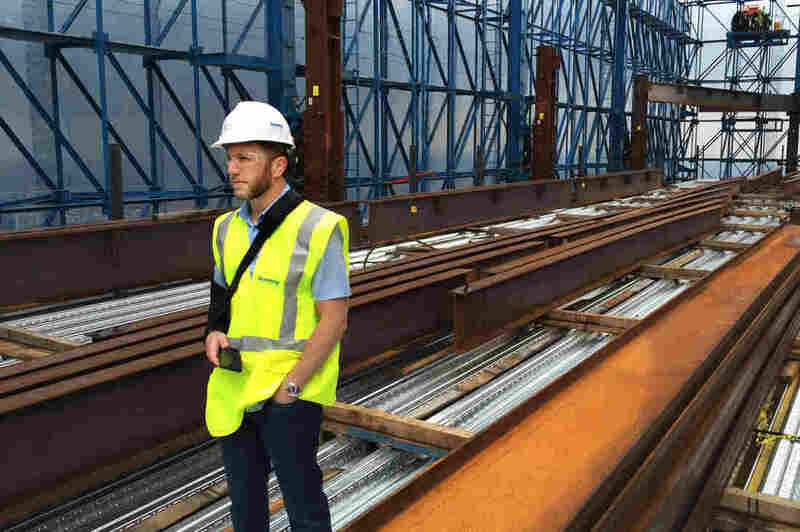 Jeremy Moss, who manages leasing for Silverstein Properties, stands on what will be the 75th floor of Three World Trade Center. Aboveground, developers say they're constructing living memorials through new skyscrapers. Their business strategy has shifted toward tenants from the tech and creative industries. "It's not your grandfather's Wall Street," says Janno Lieber, who manages the center's development for Silverstein Properties, which is currently building Three World Trade Center. Still, it's a site burdened with many competing interests that include business owners, politicians, victims' families and tourists. "One desire is certainly to express power and strength, but I think a sense of loss and vulnerability is also very present there. And those two things don't go neatly together," says Elizabeth Greenspan, an anthropologist who wrote Battle for Ground Zero. But she adds that contradiction is required right now at the World Trade Center, as the U.S. continues grappling with Sept. 11's legacy.